Ein schönes Stück Zeitgeschichte, das auf diesen beiden CDs versammelt ist. Sowohl die erste Aufnahme von "Remembering JFK", als auch die Aufnahme des Konzertes von 1961 sind nicht nur historisch interessant, sondern auch musikalisch. Mr. Eschenbach and the orchestra somehow reached an entirely new plane of excellence during this performance (of Symphonic Dances from 'West Side Story'). (...) Mr. Eschenbach himself, though a European by birth, seemed somehow to be channeling Bernstein's quirky, jazzy personality right into the players themselves. It's an awesome, visceral performance. (...) Mr. Barto's playing is eccentric, and yet, paradoxically, challenging and fascinating. In dem uramerikanischen Repertoire von Bernstein und Gershwin fühlen sich die Musiker offenbar absolut zuhause. (...) Im "Concerto in F" von Gershwin zeigt [das NSO] sich klanglich noch flexibler und mit einem breiteren Farbspektrum. (...) Tzimon Barto ist der ideale Solist für dieses Projekt. 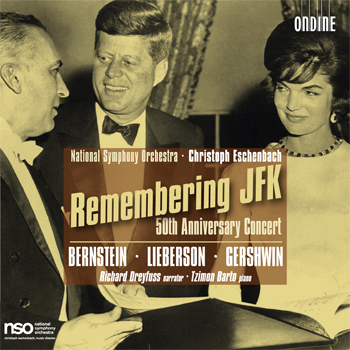 This double CD release celebrates the memory of John F. Kennedy, and the 50th anniversary of his inauguration as U.S. President, by coupling new and historic recordings performed by the National Symphony Orchestra of Washington, D.C. The first disc features Christoph Eschenbach conducting the January 2011 anniversary concert at the Kennedy Center. It includes the world premiere recording of one of the late Peter Lieberson's last works, Remembering JFK (An American Elegy), with famous actor Richard Dreyfuss narrating excerpts from speeches of President Kennedy. Also included are Bernstein's popular Symphonic Dances from ‘West Side Story'. The second disc features excerpts from the previously unreleased 1961 Inaugural Concert, under the direction of then-Music Director Howard Mitchell, including radio commentary from the original broadcast. At the Kennedys' request, the Inaugural Program emphasized American composers, and the excerpts selected include John La Montaine's Overture From Sea to Shining Sea (commissioned by the NSO specifically for the Inaugural Concert) and the first movement from Randall Thompson's Testament of Freedom (with the Georgetown University Glee Club). A special focus is on the music of George Gershwin: the 2011 recording features acclaimed pianist Tzimon Barto as soloist in the Concerto in F, while the 1961 broadcast includes Rhapsody in Blue with piano soloist Earl Wild. Celebrating its 80th anniversary season, the NSO here presents is first recording under its new music director Christoph Eschenbach, as well as the opening of a recording partnership with Ondine. The NSO's first commercial recording in ten years was made possible in part by an award from the National Endowment for the Arts.